I love these shoes. They are insane and amazing. From the retro shape to the beautiful leopard/cow print. The last time I wore them was to a wedding and I wore a lovely yellow tulle dress and all my accessories were black and white and of course my outfit was one of my favorites ever and I didn’t get a single photo. Cruel fate. The shoes are incredibly comfortable thanks to that huge platform. I’ve worn them all night long and it was completely fine. I even danced in them so they really passed the test. Definitely favorites, you’ll be seeing these again sometime soon, I can promise you that! *Now as for the outfit, I’ll be honest, not one of my best. It was okay but not a favorite. The jacket is completely awesome but can be a little difficult to wear and it was the first time I wore it actually. I got it in the post winter Zara sale after harassing M to buy me something. I’m planning to wear it again this week but I’ll pair it with a dress. The shorts are from H&M and shockingly I couldn’t find an outfit photo of my wearing them. I’m sure I’ve worn them before though. It’s a mystery. Maybe I’ve just had more sense in the past and not posted photos of myself on the internet where I’m wearing crazy pink biker shorts. Who knows. March 2012 – worn to the pub. I obviously like pairing this poor shirt with some crazy bottoms. Red leather pants, well, why not. Oh and those amazing slouchy boots – those were one of my all time favorite pairs of shoes. Sadly, they’ve since been thrown away as they were completely falling apart. I’m still looking for a replacement pair but nothing has so far come close. 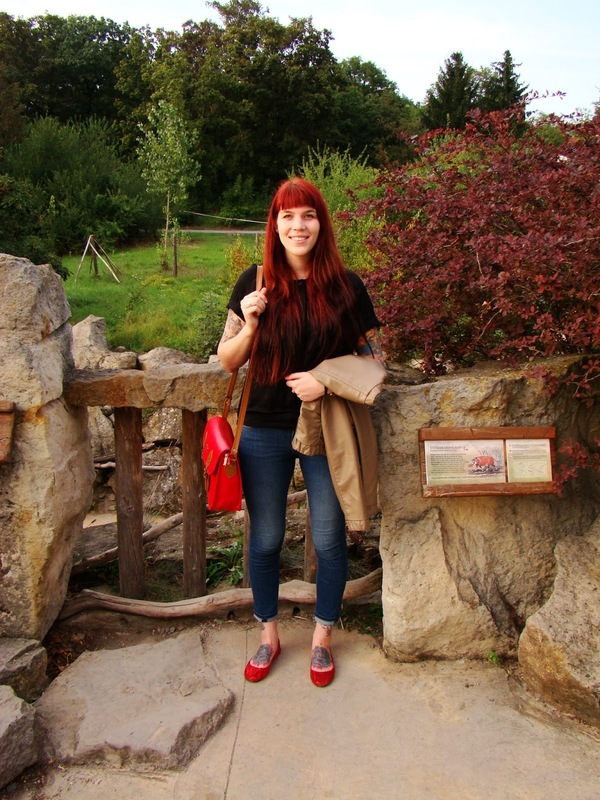 September 2013 – Zoo outing. And instead of crazy pants I had some crazy hair going on. I actually miss my crazy red hair. But blonde is much easier to maintain more fun. I also wore the shirt and jeans combo later that night to go to the pub near our old flat. I miss that pub (and well, having a pub within a ten meter walking distance. I could get away with wearing the most outrageous shoes.) The shoes pictured below are Zara. Sorry about my weird facial expression, I think I may have been drunk. But back to the present, the outfit was worn on Saturday to lunch and a spot of shopping. Even with the coolness of the jacket and the awesomeness of the shoes, I was still happy to get home and change back into my pajamas because that what the weekend is really about. Anyways, wishing everyone a perfect Monday. See you tomorrow.